The Warrior Ritual VR2 stick is a light, agile, and an affordable stick. It is stylish and is very durable. I currently own this stick and I have found one problem with it but its something that is not a huge flaw and has to do with weight distribution. This stick is also very easy to handle and has a nice easy grip area for easy handling. The weight of the stick is very good as it is heavier but not too heavy. 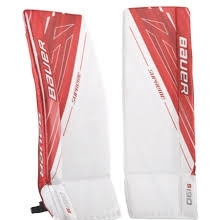 It is not the lightest stick on the market for sure but it is a nice medium weight for goaltenders that like to have a stick with more weight to it. The problem with the weight is it could be more evenly distributed along the stick as it is a little heavier to the blade. This stick is very agile as it is very air dynamic. The paddle is shaped so side to side movement is very easy and the stick does not hold you back. The big thing I noticed, despite the weight, it was very easy to move. It did not drag behind my body it stayed with it and became a part of it. This stick is very durable. It has withstood countless slap shots and shots off the shaft and has yet to chip. It is holding its own and is not opening up to reveal the inside. I have used it for about 5 months now and it has no signs of breaking down or wearing out. The Warrior Ritual VR2 is a very affordable stick for any goaltender. It is coming in at 99.99 and is worth every penny. It is sturdy and a good looking piece of equipment. The stick is a cheap lightweight composite stick that is perfect for the goalies looking for a good cheap stick. This stick is perfect for a goalie not looking to break the piggy bank open to get a decent composite stick. It is very durable and air dynamic. The stick would be good for a minor leaguer or as a backup stick to a more high-end stick.